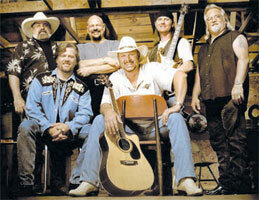 Groupe Country US formé en 1987 à Atlanta (Georgie) et composé de Danny Shirley (né le 12 Août 1956 à Chattanooga (Tennessee)), Mark Dufresne, Wayne Secrest, Chris McDaniel (jusqu'en 1999), Michael Lamb, Gates Nichols, Jimmy Dormire, Cody McCarver (entré en 1999). Often described as a cross between Alabama and Lynyrd Skynyrd, Confederate Railroad made their name with a party-ready hybrid of modern country and Southern rock, which also earned them comparisons to Charlie Daniels and Hank Williams, Jr. Their trashy, roughneck wardrobe was a good indicator of their rowdy, tongue-in-cheek sense of humor, but they were also able to balance that with a sincere sentimental streak. Singer/guitarist Danny Shirley, lead guitarist Michael Lamb, steel guitarist Gates Nichols, keyboardist Chris McDaniel, bassist Wayne Secrest, and drummer Mark Dufresne got together in the early '80s and spent years playing the Atlanta bar scene, eventually merging into a tight unit with original material. They served as the house band at Miss Kitty's in Marietta, GA, for several years and also worked as a backing band on the road behind Johnny Paycheck and David Allan Coe. After around a decade of paying dues, Confederate Railroadfinally earned a shot with Atlantic, and released their self-titled debut album in 1992. Lead single "She Took It Like a Man" inched into the Top 40, but the record really took off with the next two singles; "Jesus and Mama" and "Queen of Memphis" both shot into the country Top Five. Fan favorite "Trashy Women" also made the Top Ten, and two additional singles -- "When You Leave That Way You Can Never Go Back" and "She Never Cried" -- hit the Top 40. With such a large store of hits, Confederate Railroad went double platinum. The band's 1994 follow-up, Notorious, also sold over a million copies and spawned another Top Ten hit with "Daddy Never Was the Cadillac Kind"; another concert favorite, "Elvis and Andy," made the Top 20. The title track of 1995's When and Where proved to be their last significant hit for a while, and guitarist Lamb left the band, to be replaced by Jimmy Dormire. Arriving in 1998, Keep on Rockin'confirmed the band's downward commercial slide, and keyboardist McDaniel eventually left as well; his replacement was Cody McCarver. Confederate Railroad parted ways with Atlantic and signed with the smaller Audium label for their next album, 2001's Unleashed, which spawned the hit singles "That's What Brothers Do" and "She Treats Her Body Like a Temple." The band continued to perform live, but it would be nearly five years before Confederate Railroad would step back into the studio. The resulting Cheap Thrills, released via Shanachie, found the group tackling 11 cover songs, the majority of which were from Southern rock and country artists like Billie Joe Shaver, Alan Jackson, and Johnny Paycheck. The band moved to E1 Music in 2010 and released its very first concert album, Live: Back to the Barroom. Lucky to Be Alive, the group's seventh studio long-player and first album in nine years, dropped in 2016 via Sony Music. 1986 SP AMOR DS 1010 (US) . Danny SHIRLEY - One For The Gipper / ? 08/1987 SP AMOR DS45-2001 (US) . 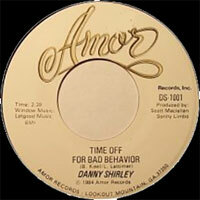 Danny SHIRLEY - Deep Down (Everybody Wants To Be From Dixie) / ? 11/1987 SP AMOR DS45-2002 (US) . 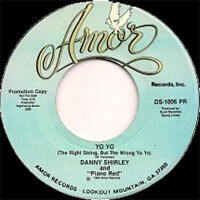 Danny SHIRLEY - Going To California / ? 02/1988 SP AMOR DS45-2004 (US) . 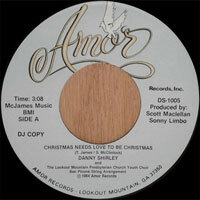 Danny SHIRLEY - I Make The Living (She Makes The Living Worthwhile) / ? 1989 SP AIRBORNE ABS 10018 (US) . Danny SHIRLEY - Sweet Lisa / ? 1992 CD ATLANTIC 4469 (US) She Took It Like A Man / ? 1993 CD ATLANTIC ? (US) . She Never Cried / ? 1994 CD ATLANTIC 82505 (US) . Summer In Dixie / ? 1995 CD ATLANTIC ? (US) . When And Where / ? 1995 CD ATLANTIC ? (US) . When He Was My Age / ? 1996 CD ATLANTIC ? (US) . See Ya / ?